John Liver Eating Johnston. Farmer, sailor, teamster, trapper, hunter, guide, scout, deputy, Union Private, trader, and more. A frontiersman born in New Jersey, sailing the seas then digging for gold in the Montana Territory and continuing to live a robust, adventurous life in the west dodging arrows, bullets, fists, weather, animals, until the frailty of old age came upon him. John Liver Eating Johnston was known as John Johnson, Jack Johnson, John Johnston, Liver Eating Johnson, the Livereater, and probably other names no one would dare say with him nearby. He was noted to be surly, extremely strong and a loner. But did you know his birth name was Garrison? What kind of man was he? What was his roots? What did he do to be remembered even now 107 years after his demise? And, who is he related to? Where is he buried? How big was he? There are many seeking the answers to these questions and more. Do, write in, ask, seek answers, add your own findings. Information is out there, in archives, libraries, diaries, and folk's dusty memories. A culmination of gathered facts can bring Johnston's real life to canvas. There are not very many books written on “Liver Eating” Johnson. There was the fictional movie Jeremiah Johnson and then the fictional Crow Killer: The Saga of Liver Eating Johnson by Raymond Thorpe and Richard Bunker. Finally, I found a knowledgeable researched source that was just published in 2008: The Avenging Fury of the Plains by Dennis John Mclelland Ed.D. Liver Eating Johnson’s real name was John Garrison Johnston. Johnston was born in Little York, New Jersey in July of 1824 to Isaac and Eliza Garrison. He had 5 sisters and may have also had a brother who died in Virginia during the Civil War. Of Irish or Scottish descent, Johnston’s father was an alcoholic and nearly worked young Johnston to death. The brutality of his father when Johnston was young and helpless may have had a part in making him the adult capable of doing almost any violent act that he became. The apparent rage inside him most of the time shows that his father also toughened him. Isaac would send his son to farms to work off his own debt. Johnston tired of this treatment and began working on a coastal schooner hunting whales. He was then at sea for 12 or 13 years. This is where he developed his powerful frame. The high sea became boring for Johnston so he enlisted in the U.S. Navy during the Mexican War. It is not known how long Johnston served as a sailor but was obviously not very long because of his temper. Johnston was an impulsive man with a lack of self-control and a very hot temper. When the Lieutenant in charge struck one of his comrades with a sword, Johnston, in a fit of rage, struck him in the neck, which laid him out senseless on the deck of the ship. When the Lieutenant came to, he didn’t know whether lightning or a spar had hit him, but he thought it was Johnston. Because of being suspected of striking a superior officer, he didn’t get any shore leave for 30 days. When he finally was allowed to go to ashore, he never came back and ventured off into the unknown west. The events described above were taking place when, in the movie Jeremiah Johnson and in the book by Thorpe and Bunker, Johnston’s squaw the Swan and Johnston’s son were supposedly being killed by the Crow. This proves the story was false. After this, came the myth that Johnston sought revenge and went on a rampage against the Crow. Supposedly, this made a Crow chief mad, so he sent 20 of his best warriors after Johnston one at a time. Johnston, they said, killed them all. Johnston’s military record also proves there was no Crow Vendetta against him for that reason. Johnston was actually friends with the Crow most of the time, so it was all a big tall tale. The “Crow Chief” that supposedly induced 20 warriors after Johnston wasn’t even Crow. Johnston changed his name to Johnston from Garrison because he was now a deserter on the run and would be hung if caught. Johnston then joined the gold rush. He mined in California then (dates unknown) moved east and ended up in Colorado. He later moved up through Wyoming and into southern Montana where he mined, hunted, trapped, wolfed, bootlegged, peddled whiskey, cut wood and worked as a scout for General Miles Nelson and many others. But mainly he fought Indians. This is where he met his friend and partner J.X. Beidler. The two men had two things in common: whiskey and violence. Johnston was with Beidler on and off until he retired. Johnston like his father was an alcoholic despite the other stories from Thorpe and Bunker’s book. It was now when Johnston’s legend began to build. Johnston was a legend in and after his time, which resulted in many “fairy tales”. Of the many things Johnston did, his nickname proved a lie for he never consumed a human liver. He was tagged with his false name during a battle with the Sioux in 1868. Some claim the battle was in 1869 or 1870, but Johnston himself stated it was in 1868. Johnston and 15 other woodcutters were attacked by the Sioux as they were cutting wood to fuel steamboats on Sioux land. At the end of the battle Johnston stabbed a warrior in the side. When he withdrew his knife, there was a bit of liver remaining on the blade. As a joke Johnston turned to his friends, held up his knife, and then asked if they “wanted a chaw”. In the winter of 1863 Johnston joined the 1st Division 2nd Colorado Calvary 4th Brigade H Company as a Private/Scout in the Civil War. He lied about his age and said he was 33 when he was really 39. Johnston deserted only 5 days after he enlisted. It is suspected although uncertain that the reason he deserted was to go spend all the money he had been paid on whiskey. Johnston eventually came back to find the Second Colorado Calvary just staying at the fort awaiting orders. Later Johnston was reassigned to the 2nd regiment. In October of 1864 Johnston was shot in the leg and shoulder in the battles of Westport and Newtonia in Missouri. Johnston fought in the war until he was discharged on September 23, 1865. Johnston returned to Montana territory not sure of anything that lay ahead. He ended up going back to the gold fields and fighting Indians. 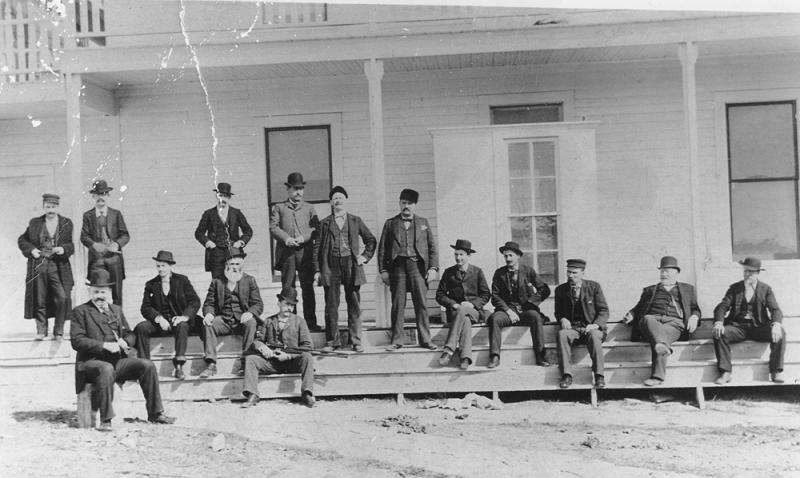 When he left the gold fields, Johnston spent all the money he owned on whiskey in Fort Benton. After he ran out of money to fuel his drunk, he went back to work as a teamster delivering supplies to miners. Johnston then met up with his old partner J.X. Beidler. Johnston and Beidler set up camp and wood hawked on the Missouri river right in the middle of Sioux land. Wood hawking was dangerous anyways but right in the middle of Sioux land it was almost suicide. They were attacked on a regular basis and soon decided to take a break. Beidler went his own way and Johnston went out alone hunting and trapping for awhile. Johnston was one of a kind to still be hunting and trapping into his 60s. Eventually, Johnston and Beidler were back to their wood hawking camp. Johnston was often seen with Indian skulls on stakes next to the river trying to sell the body parts to tourists passing on the steamboats. Being a wood hawk meant being fearless. In the summer of 68 seven woodcutters were killed. Johnston returned again to the wilderness to trap and hunt. Sioux would steal Johnston’s beaver traps and pelt, which angered Johnston so he would set up traps for them and outsmart them. Sometimes he would make a tent and make it look like he had left quickly and leave a piece of poisoned meat for the Indians to eat. Once when three Sioux waited inside Johnston’s cabin for his return, he outsmarted them by climbing in a pre-dug tunnel and shooting one of the Indians through the floorboards. Johnston continued this lifestyle for years participating in every big fight there was. Johnston also served as a scout for General Miles several different times participating in catching Chief Joseph and fighting in many more battles. But Johnston, bored with this life, looked for different work. In 1868 Johnston and J.X. Beidler got together and peddled bootlegged whiskey to Indians until about 1873. There was a territory called Whoop Up Territory, which was one of the most dangerous places that rarely a white man dared to go. Johnston didn’t care. Since the Indians knew him as a bad spirit, he was allowed a free ride across some of the most dangerous hostile lands in the west. During this time Johnston was peddling whiskey under the cover of nightfall and hiding the whiskey during the day. After Johnston now in his 50s gave up the dangerous game of bootlegging whiskey, he guided some trips into the mountains in south central and southeastern Montana since he knew the area better than any man alive. After these trips he went back to scouting for General Miles and many others. In the years to follow Johnston scouts, hunts, traps, and runs a stagecoach line on and off. He became a lawman in Coulson, Montana (now known as Billings) and then joined a Wild West show, which also lead to a dead end so Johnston returned and resumed his job as a lawman in Coulson. He decided he didn’t want to work anymore and was tired of the social life so built a cabin in the mountains where he could live the rest of his life. Johnston built that cabin in Red Lodge where he hoped to never work again. But later he hired on as Sheriff until, having much trouble from his shoulder wound obtained in the civil war, he retired at the age of 70. Johnston went on one more trip to Tombstone, Arizona. He returned to Red Lodge and almost overnight they say got old. In the last year of his life, 1899, Johnston moved to a veteran’s hospital in Los Angeles, California where he died on January 21, 1900. Johnston’s body was buried in California for years but with much negotiating and dispute it was moved to Old Trail Town in Cody, WY. Cody is near some of Johnston’s favorite stomping grounds being only 65 miles from Red Lodge, MT. Between Red Lodge and Cody was one of Johnston’s favorite mountain ranges, the Beartooths, where some backwoodsmen today claim to notice the smell of pipe tobacco drifting into camp and they then report seeing the ghostly figure of Johnston leading a pack string down an ancient trail smoking a pipe in the moonlight. This image is the first known photograph of Johnston. He was on scout during the 1876-1877 Sioux campaign in Montana Territory. This is the Hunter Hot Springs photo. See the fellow in the beard? Supposedly that is Johnston. Jason Leaf has spent a considerable amount of time researching this picture. 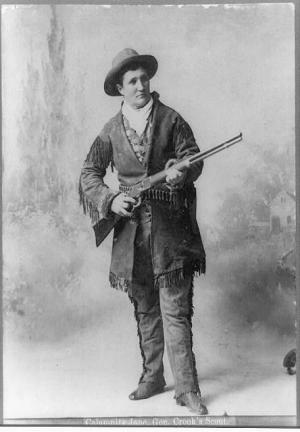 Calamity Jane at age 33. Photo by H.R. Locke.Henry R. Locke was an American photographer in the 19th century who photographed the Wild West. He ran a studio in Deadwood, South Dakota. He photographed the Black Hills area, Deadwood, Crow Indians, farmers, miners, railroads, but also Calamity Jane (1885) and the Little Big Horn battlefield. Montana Monographs is a series of interviews, anecdotal historical stories and short biographies of the pioneers of Montana in the 1870’s and 1880’s. It was edited by, my grandfather, I.D. O’Donnell in the late 1920s. The stories, with archival photographs, cover over 60 pioneers including John Burkman (Custer’s orderly), “Calamity Jane”, “Liver Eating” Johnson, Parmly Billings, “Teddy Blue” Abbott, “Swordbearer”, and “White Quiver”. Diamond R. Brown was building trading posts on the “Whoop Up” trail in the 1870’s. Joseph Cochrane, Johnnie Reardon and Forest Young were here when the Nez Perce came through in September 1877. This was the time of the “Indian Wars”. Montana Monographs is an accurate snapshot of what life was like in the “Clarks Fork Bottom” in pioneer days. Montana Monographs is available for $34.95 plus $5.00 shipping (in the US) from Harley O'Donnell, 1133 S. 72nd St. W., Billings, Montana, 59106.
e-mail address is HOdon21621@ aol.com. Calamity Jane by James D. McLaird(University of Oklahoma Press) with a fine chapter noting the wild west show of 1884 she, Johnston and others were in. Jon Axline, "In League with the Devil: Boone Helm and 'Liver-Eatin' Johnston'," in, Still Speaking Ill of the Dead: More Jerks in Montana History, edited by Jon Axline and Jodie Foley. Guilford, Connecticut and Helena, Montana: Two Dot,Globe Pequot Press, 2005. Nathan E. Bender, “Perceptions of a Mountain Man: John “Jeremiah Liver-Eating” Johnston at Old Trail Town, Cody, Wyoming.” The Rocky Mountain Fur Trade Journal v.1 (2007): 93-106. Published by Museum of the Mountain Man, Pinedale, Wyoming. Nathan E. Bender, “The Abandoned Scout’s Revenge: Origins of the Crow Killer Saga of Liver-Eating Johnson,” Annals of Wyoming v. 78 n. 4 (Autumn 2006): 2-17. Published by the Wyoming State Historical Society. Nathan E. Bender, “A Hawken Rifle and Bowie Knife of John ‘Liver-Eating’ Johnson,” Arms & Armour: Journal of the Royal Armouries, v. 3 n. 2 (October 2006): 159-170. Published by the Royal Armouries, Leeds, England. Johnston was portrayed by actor Robert Redford, in the movie, Jeremiah Johnson as a character separate from the historical facts. The book details, and corrects, the many errors about Johnston's life as found in the historical fiction of Thorp and Bunker's The Crow Killer: The Saga of Liver-Eating Johnson.